Lucille and Desi met in May of 1940 in a Hollywood studio commissary while having lunch. They were introduced to one another by a director, George Abbott, who was working with Desi. Lucille was dressed up like a burlesque queen for a role in “Dance, Girl, Dance“- complete with a black eye courtesy of stage make-up. Later in the day, they met again. Not only had she lost the black eye, Lucille had changed into a yellow skirt and cashmere sweater. Desi asked her out and they fell in love almost immediately. The big wigs at the studio didn’t want them to marry, claiming that it would hurt their careers. Fortunately, love won out and on November 30, 1940 (just 6 months after meeting) they got married at 10:00 am by a Justice of the Peace in Greenwich, Connecticut. “I Love Lucy” was based on a popular radio program Lucille was in called “My Favorite Husband.” She played the role of the wife, with Richard Denning playing the “favorite husband.” Denning is better known for his role as the mayor in a 12 year stint on Hawaii 5 O.
CBS loved the radio show and wanted to develop it into a tv program, with Lucille and Richard as the married couple. 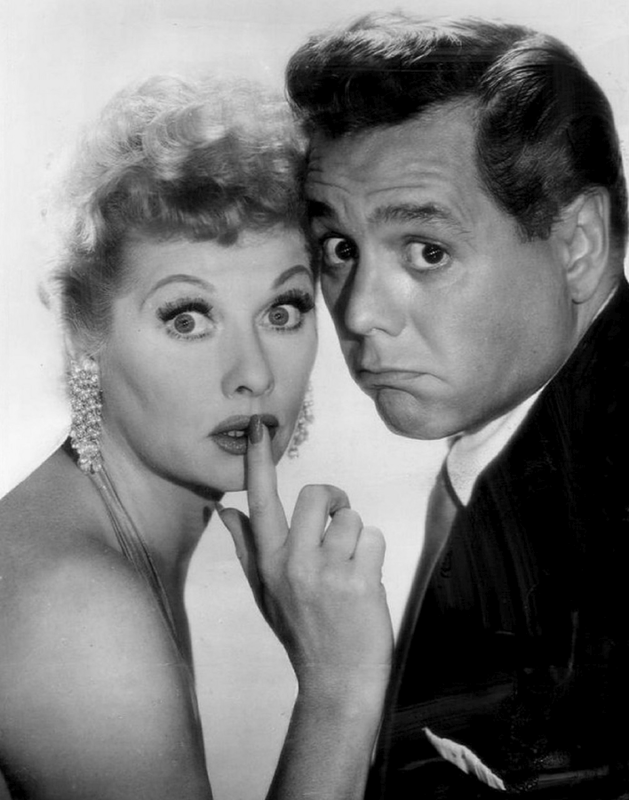 Lucille wanted Desi to be her on-air husband, but the network tried to convince her that audiences wouldn’t believe that she and Desi would make a logical married couple. However the network and the advertising agency weren’t buying it. They really didn’t even want to consider Desi in the role. Lucille and Desi decided to “go out and test it” – see if people could accept them as husband and wife. In April 1950, they formed Desilu Productions. All they needed was an act, so they put together a series of comedy routines involving a “movie star” who tries to join her bandleader husband’s act. The act featured comedy dialogue by Lucy’s radio writers (and two of the future I Love Lucy writers), Madelyn Pugh and Bob Carrol, Jr. It opened on June 2, 1950 at the Chicago Paramount Theater and was a HUGE success.